Join us for an evening of delicious food and fantastic music with talented local singer/songwriter Tom Mills! Start off your evening by indulging in a delicious meal at Cabot Shores Bistro. Whether you’re vegetarian, vegan, gluten-free, a local seafood lover, carnivore or somewhere in between, you’ll be sure to find something on our menu that delights your taste buds! After dinner listen to talented local musician Tom Mills! See below for schedule and ticket information. 5:30-8 pm: Dinner at Cabot Shores Bistro. Meat, Seafood, Vegetarian, and vegan options. Please let us know of any dietary restrictions and we will do our best to accommodate. Dinner and Concert Admission: $45+tax. Click here to purchase meal and concert package. Alcohol extra. Concert Admission: $15+tax. Click here to purchase concert ticket only (no dinner). Concert starts at 8pm sharp. 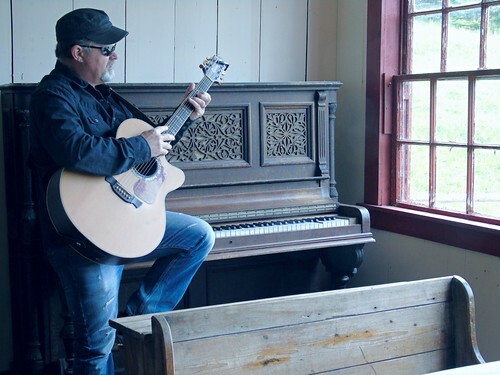 Tom Mills is a singer / songwriter / multi-instrumentalist from Cape Breton who has been involved in the local music scene for over 30+ years. He is actively writing, recording, and playing various pubs, private shows, and festivals around the Maritimes and has just released a self-titled open-tuning instrumental Celtic Style CD for guitar in 2017 entitled “Full Strings Ahead“. Tom played in a dozen or more cover bands throughout the 80’s and 90’s and began writing original material and recording around 2007 with a band called The Mizzen Men “Folk Songs & Sea Shanties”. Songs like “Steel Winds” and “That Maritime Song” were recorded on that project and garnished a fair amount of airplay on local radio stations in Cape Breton. Tom followed that up with a new recording in 2012 “Crossin That Bridge” with his roots band Wills Addiction (http://willsaddiction.com/our-music) featuring such original songs as “The Old Wishing Well”, “The Giant Fiddle”, and “Crossin That Bridge”. One song on the album “I Like Girls” was featured in the soundtrack for a local Comedy Horror Flick “The Legend of the Psychotic Forest Ranger”. With hard driving rock riffs and satirical lyrics that poke fun at the 80’s, the movie was written and directed by Brad Mills (Bradmills.ca) and filmed by his sister Jacquelyn Mills (Jacquelynmills.ca), both born and raised in Cape Breton (Tom’s children). Most recently, Tom was asked to re-record his song “Steel Winds” for the “Songs of Steel, Coal, & Protest” album project released in 2016 by Richard MacKinnon, the project coordinator and also a CBU professor.